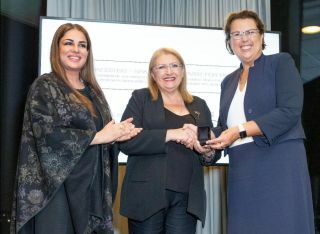 Namira Salim, Founder of Space Trust, and Marie-Louise Coleiro Preca, President of Malta, presents the Space Peace Prize to UNOOSA and Simonetta Di Pippo, Director UN Office for Outer Space Affairs on Sept. 26, 2018 at "Space2030: Space as a Driver for Peace." UNITED NATIONS — Experts in the space sector, diplomats, political leaders and more gathered last night (Sept. 26) at the United Nations (U.N.) headquarters for "Space2030: Space as a Driver for Peace," a side event of the 73rd session of the U.N. General Assembly. At "Space2030," an inflatable orb called the "Black Marble Earth," which shows what the planet would look like from space at night, served as a stunning backdrop for high-level conversations about the future of human activity in space. The event was arranged by convening partners United Nations Office for Outer Space Affairs (UNOOSA), United Nations Office for Partnerships (UNOP) and Space Trust. Manlio Di Stephano, Under-Secretary of State of Italy (left); Marie-Louise Coleiro Preca, President of Malta (center-left); Simonetta Di Pippo, Director of UN Office for Outer Space Affairs (center-right); and Namira Salim, Founder and Executive Chairperson of Space Trust (right) stand next to the Black Marble Earth at "Space2030: Space as a Driver for Peace." After the guests mingled, Namira Salim, founder and executive president of Space Trust, gathered everyone together as Skinner introduced Di Pippo to the stage. Di Pippo detailed the many ways in which UNOOSA is working hard to ensure peace in space and equal access for all countries. However, "What remains to be seen," Di Pippo said, "is how we can work collectively to organize our efforts to deliver the full potential of space for sustainable development. The path to realizing this ambition is captured by the "Space2030" agenda, which member states will negotiate over the next two years." For many, it might be difficult to even see why we would need to discuss peace in space, since only a select few astronauts live there, and only temporarily. But access to space-based technologies as well as data from this tech, the ability to send scientific experiments, collaboration between the private and public space sectors, the speakers said — peaceful and equal collaboration and access in space is essential to progress. Di Pippo cited the U.N.'s Sustainable Development Goals to further emphasize the importance of space: "Out of the 169 targets [in the Sustainable Development Goals] underpinning the goals, no less than 40 percent are reliant on access to space. … When policy-makers need to make well informed policy decisions, they're turning to space." Next, leaders such as President Marie-Louise Coleiro Preca of Malta and a representative from Cyprus discussed how space has always been fascinating to us as humans: "Space has captured the imaginations of countless musicians, artists and poets," she said. She continued, stressing the importance of the "Space2030" agenda, and how we must :rediscover our love for the earth." Helena Mina, the Director of the Diplomatic Office of the President of the Republic of Cyprus, echoed the importance of space and "Space2030", and she expressed Cyprus' interest and dedication to peace in space, stating that "even small nations like Cyprus and Malta can be catalytic drivers for space diplomacy." Later in the night, Salim, alongside President Marie-Louise Coleiro Preca, presented Space Trust's Space Peace Prize to UNOOSA and Di Pippo. Discussions like "Space2030" are major steps toward organizing collaborative efforts to support peaceful human activity in and access to space, the speakers said. Di Pippo made sure to emphasize not only the importance of the event but also the importance of space to policy and our future. "Let me be very clear," Di Pippo said. "Space is fundamental to effective policymaking in the 21st century. The challenge, therefore, is how to keep space as a peaceful environment in which science and technology can continue to deliver the information and data that is helping to make effective policy decisions around the world." The industry partner for "Space2030" was the Commercial Spaceflight Federation and the event's media partner was Space.com.